In the mountain region of Western North Carolina a sure harbinger of spring is the arrival at table and produce stands of ramps the wild leek of Appalachia. Ramps (Allium tricoccum ) grow in the rich, moist soil of cool deciduous forests and are among the first plants to appear in the spring. Traditonally they were eagerly collected and consumed as the season's first greens and were consiidered a spring tonic rich in vitamins and minerals after the long winter without fresh vegetables. Simple fare using ramps include fried potatoes, scrambled eggs, soups, meatloaf and bread stuffing for chicken or turkey. The ramp has a strong onion & garlic flavor that can substitute for either ingredient in contemporary recipes. Ramps have in the last decade become very popular with trendy restaurants in New York and elsewhere making the collection of wild ramps a problem as over picking has dwindled the natural supply. 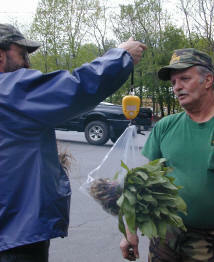 Ramp picking in the Smokey Mountain National Park, for instance is now prohibited as is harvesting ramps on other public lands. It takes several years for a harvested patch of ramps to recover and produce anew. Because of the rising demand for fresh ramps an effort to conserve native populations and meet the rising demand for ramps local universities are developing sustainable cultivation practices for ramps. Trim roots from ramps and slip off outer skin on bulbs if loose. Cut off and reserve leaves, leaving white bulbs attached to slender pink stems. Put leaves and bulbs in separate bowls. Pat chicken dry. Put in a flameproof large shallow roasting pan, without crowding, and surround with potatoes. Drizzle with 2 tablespoons oil and rub all over to coat evenly. Arrange chicken skin sides up and season with salt and pepper. Roast in upper third of oven 20 minutes. Boil wine until reduced to about 1/4 cup and add broth. When broth boils, add ramp leaves and stir until wilted and tender, 1 to 2 minutes. Remove with tongs and add to chicken. Boil pan juices until reduced to about 1/2 cup and pour around chicken. By popular demand, the recipe! Combine flour, baking soda, salt, cinnamon, nutmeg and dried fruits and walnuts. Make a well in center of dried ingredients, combine with the butter-sugar until well mixed. The mixture will be very dense, mix with your clean bare hands if necessary. Cover with plastic wrap and let sit for 2-hours, or overnight in the refrigerator. Mold the dough by hand into 5” flat ovals and place on ungreased cookie sheet. Bake in a preheated oven set at 375 F. for about 10 minutes. Turn the cookie sheet once at the five minute mark. The cookies will be done when well browned. Let cool on cookie sheet for 5 minutes then remove to wire rack. 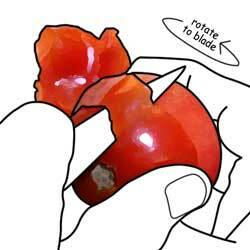 Good knife skills are a combination of knowledge and practice—the knowledge of which knives to use for which tasks, the knowledge of how to hold and move a knife, the knowledge of how various foods are structurally composed. This site offers a beautifully illustrated introduction to the subject. 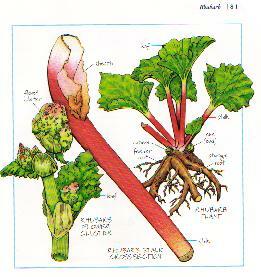 would anyone find rhubarb appealing? Rhubarb is a ancient plant with medicinal and horticultural uses going back to China 2700 BC, long before Marco Polo who first introduced it to Europe. It's earliest uses were medicinal, as a purgative and fever reducer with a value so dear it played a part in exchanges during the British opium trade. The earliest known use of rhubarb as food comes in 1778 when it appeared first in cook books as a filling for tarts and pies. Records of a Maine gardener shows cultivation of rhubarb in America 1790- 1800, with the first recorded appearance in a Massachusetts produce market in 1822. 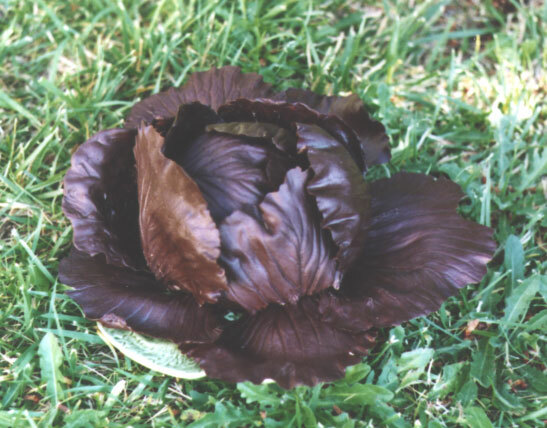 Types of rhubard have subsequently been identified in far flung parts of the world but most varieties cultivated for table use today originate from China. Growing up the only exposure I had to rhubard was in the stewed category, something my father craved and would often make for us. Strawberry rhubarb pie was common and relished by some, but I was never overly fond of it. My first real rhubarb appreciation came in the form of rhubarb crumble served in the ITN canteen in London where I was posted for a while on the foreign desk. I once made, on a challenge, a strawberry rhubarb triffle for a friend. It was superb! 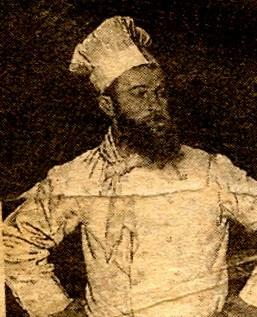 Today we have a very tongue-in-cheek appreciation for rhubarb courtesy of the Prarie Home Companion where Bebopareebop Rhubard Pie is one of the sponsors. This rustic & hearty soup will warm your body and stick to your ribs. Served with a crusty European hearth bread and, perhaps, a side salad or cole slaw it makes a wonderful cozy winter meal. 1 large meaty ham bone, or 2 smoked pork chops, or pig's feet or something similar. 1.Wash split peas, combine with water, salt pork, and ham meat in a large pot. ; bring to a boil , skim off foam, reduce head to low, simmer for about 3 hours. Remove any bones, cut the meat and salt pork into small cubes and return to pot. 3. Skim again, add sliced sausage, rosemary and as much cracked pepper ( or hot chilies) as you like). Stir constantly until heated through, adjust seasonings, serve—with a dollop of sour cream sprinkled with rosemary, or with some herby toasted rye croutons. As I put my garden to bed for the winter today I was taken with the aroma of my large stand of fennel as it was bruised, crushed and chopped down. What a scent! I've been growing bronze fennel for several years taken mostly with its pretty green lacy foliage and bright yellow flower heads in mid summer. It reseeds like crazy so I have had to be careful that it doesn't take over the garden. I once used cut leaves on top of charcoal to grill a fresh large bluefish stuffed with onion, more fennel, and lemon for a dinner party. It was the best ever! This year I harvested seeds thinking I might used them in the pistachio biscotti I make or in Italian sausage or tomato sauce. With the sweet licorice flavor these seeds impart they can be used in any dish that needs a boost of flavor. Meatloaf, chicken or turkey stuffing, soups, and salads. Combining fennel leaves and French tarragon in a chicken salad is another of my favorites. Add a few small red seedless grapes, some celery and wild rice and you have a supreme main course salad. A little crusty multi-grain bread and a bottle of white would round out that meal perfectly. 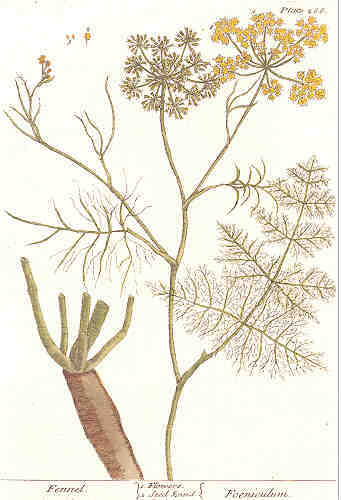 Bronze Fennel has just as many culinary uses and looks great in the garden too. What more could an edible landscape gardener ask for? I harvested some leeks for the first time ever today. This year I was interested in doing something new and leeks seemed to fit in with my idea of having an edible landscape in my small garden. It's amazing what one can harvest from a small plot with some careful planning and companion planting. I placed placed leeks in several places around the garden but the largest patch of leeks is next to the now faded New England asters just behind the hot peppers. I reckoned I better get them up before the snow plow covers them up and locked them into a deep freeze for the winter. I wish I had thought ahead before I placed them there. I was looking forward to pulling a few leeks from time-to-time during the winter. 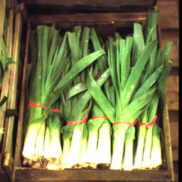 From what I read, leeks get sweeter the colder they get and even appreciate a deep freeze or two. I first learned to appreciate leeks from a British friend. I've since discovered the northern Europeans have a special place in their diets for cold weather green veg. Brussel sprouts, kale, cabbage, etc. Today I cleaned just one leek, thinly sliced it and sauted it in some butter and olive oil until I had a caramelized frieze. Then, in the same pan I added a few scrambled eggs, salt, pepper and a few shavings of gruyere. Ummm. I'm so happy I grew leeks this year. Culinary archeologists are at a loss when it comes to pinpointing the origin of the ubiquitous onion. The best guess is they were first cultivated in the Mediterranean about 5,000 years ago. The Bible refers to three types of onions (alliums): leeks, garlic and bulbous onions of the type we know today. On the North Coast onions are generally grown on muckland, a type of peat-like soil, rich in organic matter that holds water well and allows the onion bulbs to expand. Muckland is centuries old, former wetlands, high in decomposing matter laden with nutrients. Muck soils are very productive but also very expensive for farmers to maintain. Once allowed to dry out, the soil can be carried off by erosion or wind and it can never be replaced. In Elba, NY south of Batavia in Genesee County some of the finest onions in the nation are grown. They are generally of the pungent Yellow Globe variety, renown for both their spicy flavor and superb storage characteristics. On the North Coast onions are an important crop, valued at between $50-$75 million a year, ranking it 7th in the nation with about 353 million pounds. 1.Place butter and oil in pan, sauté onions slowly until golden, brown and soft. 2.Whisk eggs, cream and pepper to combine, pour over onions, sprinkle with cheese and thyme. 3. Cook eggs 5-6 minutes until almost set, then place under broiler to finish the top. 4. Cut into wedges and serve with hot buttered toast, home fries, and/or warm applesauce.